Telesat will begin with only 117 satellites while SpaceX and the others plan to launch thousands — how can they hope to compete? The answer lies in their patent-pending deployment plan. I've been following SpaceX, OneWeb and Boeing satellite Internet projects, but have not mentioned Telesat's project. Telesat is a Canadian company that has provided satellite communication service since 1972. (They claim their "predecessors" worked on Telstar, which relayed the first intercontinental transmission, in 1962). Earlier this month, the FCC approved Telesat's petition to provide Internet service in the US using a proposed constellation of 117 low-Earth orbit (LEO) satellites. Note that Telesat will begin with only 117 satellites while SpaceX and the others plan to launch thousands — how can they hope to compete? The answer lies in their patent-pending approach to deployment. They plan a polar-orbit constellation of six equally-spaced (30 degrees apart) planes inclined at 99.5 degrees at an altitude of approximately 1,000 kilometers and an inclined-orbit constellation of five equally-spaced (36 degrees apart) planes inclined at 37.4 degrees at an approximate altitude of 1,248 kilometers. Telesat's LEO constellation will combine polar (green) and inclined (red) orbits. This hybrid polar-inclined constellation will result in global coverage with a minimum elevation angle of approximately 20 degrees using their ground stations in Svalbard Norway and Inuvic Canada. Their analysis shows that 168 polar-orbit satellites would be required to match the global coverage of their 117-satellite hybrid constellation and according to Erwin Hudson, Vice President of Telesat LEO, their investment per Gbps of sellable capacity will be as low, or lower than, any existing or announced satellite system. They also say their hybrid architecture will simplify spectrum-sharing. 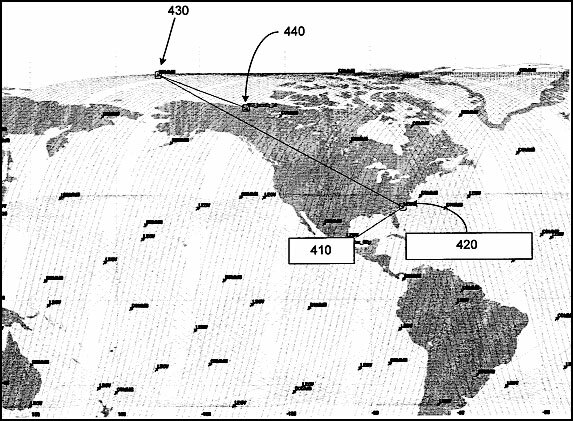 An inter-constellation route (source)The figure (right) from their patent application illustrates hybrid routing. The first hop in a route to the Internet for a user in a densely populated area like Mexico City (410) would be to a visible inclined-orbit satellite (420). The next hop would be to a satellite in the polar-orbit constellation (430), then to a ground station on the Internet (440). The up and downlinks will use radio frequencies, and the inter-satellite links will use optical transmission. Since the ground stations are in sparsely populated areas and the distances between satellites are low near the poles, capacity will be balanced. This scheme may result in Telesat customers experiencing slightly higher latencies than those of their competitors, but the difference will be negligible for nearly all applications. They will launch two satellites this year — one on a Russian Soyuz rocket and the other on an Indian Polar Satellite Launch Vehicle. These will be used in tests and Telesat says a number of their existing geostationary satellite customers are enthusiastic about participating in the tests. They will launch their phase 2 satellites beginning in 2020 and commence commercial service in 2021. They consider 25 satellites per launch vehicle a practical number so they will have global availability before their competitors. Their initial capacity will be relatively low, but they will add satellites as demand grows. Like OneWeb, Telesat will work with strategic partners for launches and design and production of satellites and antennae. They have not yet selected those partners, but are evaluating candidates and are confident they will be ready in time for their launch dates. Their existing ground stations give them a head start. (OneWeb just contracted with Hughes for ground stations). Their satellites will work with mechanical and electronically steered antennae, and each satellite will have a wide-area coverage mode for broadcast and distributing software updates. Their patent application mentions community broadband and hotspots, large enterprises, ships and planes, software updates and Internet of things, but not homes as initial markets. Telesat's Canadian patent application goes into detail on all of the above, and I'd be curious to know what exactly would be protected by it. They also consider their global spectrum priority rights from the International Telecommunication Union as an asset, but they will have to agree to spectrum sharing conventions and debris mitigation agreements. Let me conclude with a suggestion for Telesat and the Cuban government. OneWeb has committed to providing coverage to the entire state of Alaska by the end of 2020, and Telesat says they will have global coverage by 2021. I follow the state of the Internet in Cuba and think Cuba would be a good starting place for Telesat service. Cuba has the best-educated, Internet-starved population in Latin America and the Caribbean, they have very little domestic Internet infrastructure, and much of the infrastructure they do have is obsolete. Cuba is close to being an Internet "green field" and, since it is an island nation, their polar satellite "footprint" would not be densely populated. Cuba could work with Telesat to leapfrog over several infrastructure generations. If Telesat can deliver on their claims, the barriers would be political and bureaucratic, not technical. Cuba is about to change leadership, and there is some indication that Miguel Díaz-Canel, who many expect to replace Raúl Castro, will favor Internet development. SpaceX could also provide early Cuban connectivity, but dealing with a US company would be politically problematical, and Cuba and Canada have a well established political and economic relationship. Even if Cuba were willing to work with SpaceX, the current US administration would not allow them to do so. Connecting Cuba would be good for Cubans and good publicity of Telesat. For more on Telesat and their plans for LEO satellite Internet service see their patent application and you can see animations of their proposed hybrid-constellation connectivity here and here. LEO-1, Telesat's low-Earth orbit satellite, has been shipped to India for launch. The 168 kg satellite will be used in two-satellite tests of Telesat's forthcoming broadband service. Testing will begin when both test satellites are in operation. LEO-1 will be in polar orbit and I assume the other will be in an inclined orbit in order to test their two-constellation design. The Soyuz 2 launch vehicle that was to have placed 19 spacecraft into orbit has failed, destroying one of the two satellites Telesat had planned to use in the first test of their forthcoming broadband Internet service. The other has been shipped to India for launch, but the project will be delayed until the lost satellite can be replaced. SpaceX and OneWeb get a lot of publicity and have ambitious plans, but Telesat is the first LEO ISP to begin testing with potential resellers. Last January, Telesat launched a demonstration satellite and it is now ready for testing. 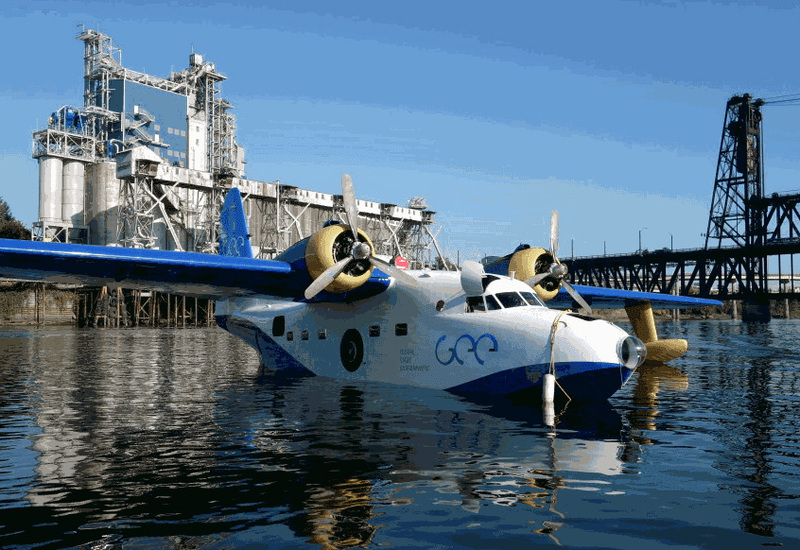 Maritime connectivity provider OmniAccess and Australian ISP Optus had committed to testing the system previously and this week they were joined by in-flight entertainment company Global Eagle Entertainment. Global Eagle CEO Josh Marks said he was persuaded to collaborate with Telesat by their planned coverage over oceans, polar regions and high-latitude routes and their "open architecture" business model. In addition to testing, they "will collaborate with Telesat on both the technology and commercial model for their new LEO platform." OneWeb and several airlines have formed the Seamless Air Alliance, which is developing standards for in-flight Internet connectivity through LEO satellites. I wonder whether Telesat and Global Eagle will join the alliance or go their own way. Telesat now expects its LEO constellation to enter service in 2022, not 2021 and they have been pledged CA$20 million from Canada’s Strategic Innovation Fund. The delay may be a result of the failure of the launch of their first test satellite, but they are now operating a second test satellite. General Dynamics will help develop terminals and Gilat will work on modem technology for Telesat. It seems that Telesat is following the OneWeb many-partners business model as opposed to SpaceX's do-it-yourself model. Telestate has entered into two new contracts, one with Thales Alenia Space and Maxar Technologies and the second one with Airbus. Reading the press releases, it sounds like they are both working on comprehensive system designs and at the end of the process, one will be selected as the prime contractor. Erwin Hudson, vice-president of Telesat LEO, also outlined their marketing strategy. In the long run, they plan to serve consumers directly through LTE or 5G mobile networks, but they will initially focus on government and enterprise companies. The long-run plan sounds similar to OneWeb's. The test plane (source)Unlike SpaceX and OneWeb, Telesat is a well established provider of geostationary (GEO) satellite connectivity. They have now demonstrated seamless connectivity and switchover between their LEO and GEO satellites and an in-flight airplane. Round trip time from the plane to ground via LEO satellite was only 19 milliseconds. While this test was not done with a plane flying at the speed and altitude of a commercial jet, it points toward a future in which airline passengers may be able to stream entertainment and have low-latency Internet access. The FCC has approved Telesat's application and they plan to award a satellite manufacturing contract in 2019 and are targeting 2022 for start of commercial LEO service. Last, but not least, Telesat has a $2.8 million contract to study inter-satellite laser links between their constellation and DARPA satellites. DARPA is also interested in learning about "commercial, commoditized buses, their operational concepts, and to define their mechanical, electrical, and network interfaces," and they have a four-month contract with Telesat to learn from them. (OneWeb and their satellite supplier Airbus have similar contracts). Last year, Telesat said they would concentrate on the maritime, aviation and cellular-backhaul markets until the cost of end-user antennas came down. As you see here, it seems to have come down. They currently plan to launch 292 satellites, but have spoken of the possibility of expanding that to 512. Perhaps they will do it now. (Inter-satellite laser links may still be a difficult technology). Telesat also announced that an undisclosed number of those 292 satellites will be launched by Blue Origin. They also completed system requirements reviews with the two teams they contracted with last year to develop system designs Airbus Defence and Space and a consortium of Thales Alenia Space and Maxar Technologies. Each team is continuing to advance their detailed designs for the complete LEO system — both space and ground segments. Local Time: Saturday, April 20, 2019 03:20 PM PDT – Page Load: 0.2915 Sec.